We've had a week or so of light or variable winds, thunderstorms and rain for a couple of days, and now it's still overcast and cooler. The weather is changing into autumn mode. At Patmos we were able to moor up to the quay without the worry of strong gusts, which would be beam on and therefore uncomfortable in the stronger summer winds. After a night at Patmos we motored to Lipsi and anchored as before in a little bay near to the main harbour so we could enjoy a cooling swim and quiet night away from the hub. 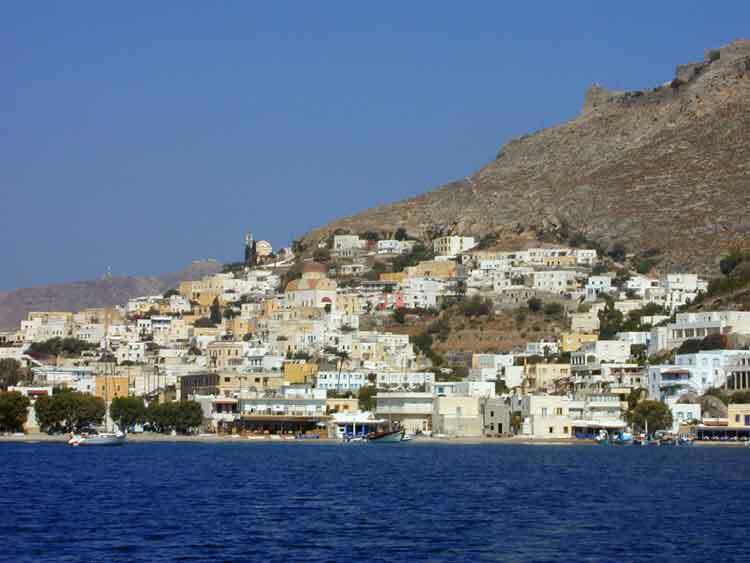 On Wednesday we motored again, south to the pretty harbour of Pandeli, on the east coast of Leros. We stopped for a swim at Plakhoudi Bay, not far from Partheni where the boatyard is. At Pandeli we thought we were in for a thunderstorm as it was cloudy and humid, but we escaped. We had another gentle night, with little wind. We finally got enough wind on Thursday for a pleasant sail around the south of Leros and into Lakki. For once we were using the full main, but we had to reef the genoa when we hit stronger winds on the west coast. We took advantage of the marina facilities to catch up with the laundry and battery charging. Then on Friday we had a good sail south to the main harbour on Kalymnos island, Pothia, again only having to reef the genoa as we made our final approach when the wind was gusting 30 knots off the southwest coast of the island. 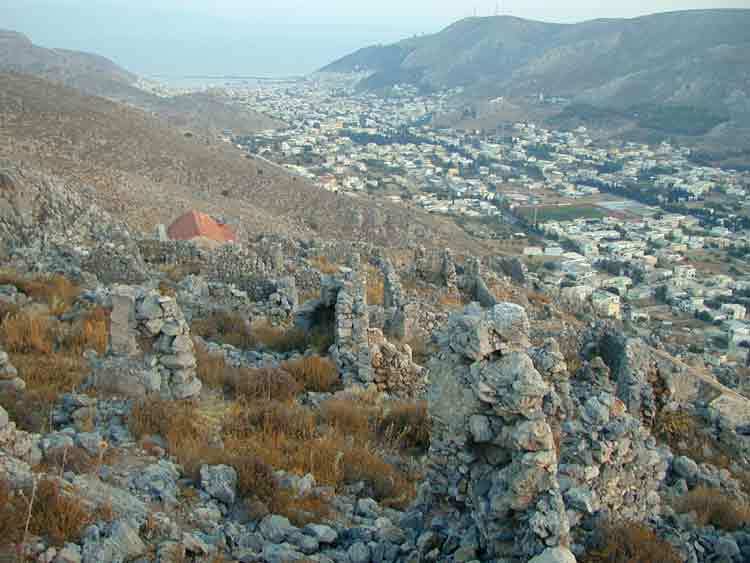 Pothia is a very large town, which merges with the smaller main town further inland. The skies were overcast and winds again light so we decided to stay put for a day and do some sight-seeing. There is plenty to see and the people are very friendly. The island used to be the sponge fishing centre of the world and the wealth it brought is evident, particularly in the predominance of large houses. On Saturday night we had thunderstorms and rain which were forecast to continue most of Sunday so we didn't venture far. 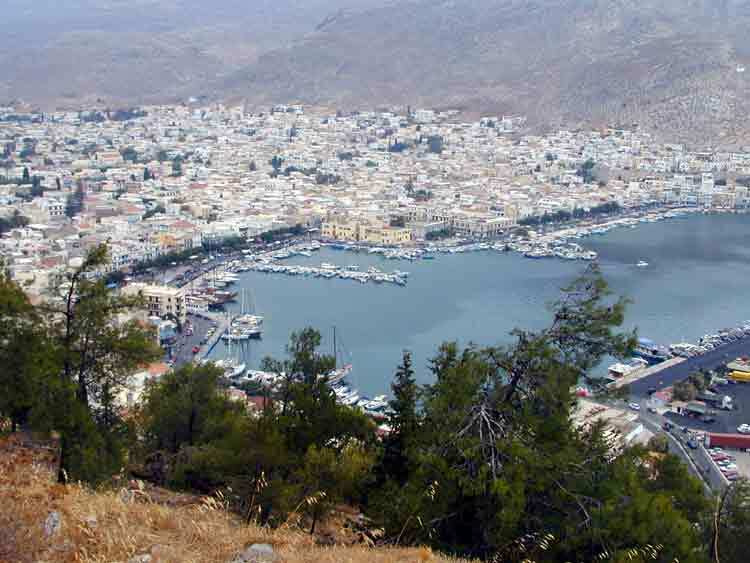 The winds were again light so we motored around the coast of Kalymnos to Vathy, a narrow but deep bay on the east side of the island. There are quite a few fish farms in the area and we were entertained by the locals towing a newly constructed fish farm unit, out of the bay. It was too big to get past some of the larger boats moored each side of the bay, so a lot of pulling and pushing was required all round. Fortunately we were moored well out of the way. Yesterday we had a good sail east and south to Kos Town, passing the little island of Pserimos, and we're now berthed in Kos Marina. It's a short walk to the town itself and we've spent the day visiting the main sights. Kos is different from all the other islands, being quite flat in places and very fertile. The island is obviously very prosperous, and there are more signs of the Ottoman era, as well as earlier influences, than on any other island we've visited. There is still a sizeable Turkish community here. Tourism is now the major industry, but the Koans seem to manage it well.